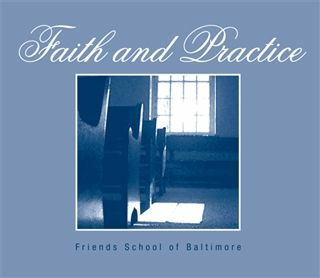 The subtle but powerful influence Friends School's Quaker philosophy has on the educational program is not easily conveyed into words, yet it’s all around. It is in the kindness and respect with which our adults and students treat one another; in the concern we share for the environment; and in the actions we undertake — often through student-led initiatives — to support victims of natural disasters and social injustice at home and abroad. The Quaker values of simplicity, peace, integrity, community, equality, stewardship, and Quaker practices, like the use of quiet reflection to foster learning and personal growth, are woven throughout the educational experience. Weekly Meeting for Worship further strengthens students' inner lives while building a sense of trust and connection among classmates. But don't take our word for it: Watch the video and hear our students speak about this unique aspect of Friends School life. What is Meeting for Worship? Meeting for Worship is a distinguishing aspect of a Friends education. Students and adults gather each week in the Stony Run Friends Meetinghouse, where they settle into silence, sometimes sharing their thoughts and observations with the group, other times using this pause to reflect, refresh, and decompress.